One of the most famous of all surnames of Germanic origins, and recorded in some fifty spelling ranging from Klaus, Kloss and Koilas, to Kollatsch, Kulik and Clausen, this is a shortform or nickname. 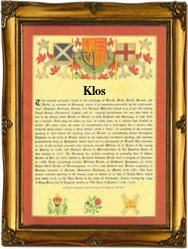 It derives from the ancient Greek name "Nikolaos", which as a surname is perhaps even more popular than Klaus! Either way the name translates as "The conquering people", a theme which no doubt contributed to its huge popularity. The Great Crusades to supposedly free the Holy Land and particularly Jerusalem, from the Saracens, in the 11th and 12th century, lead to a further boost for Klaus and its derivatives. It was the fashion for returning crusaders and pilgrims to call their children by early biblical or hebrew names, or names associated with Ancient Greece. It was from Greece that most of the crusades were launched. There were twelve in all, and all failed, but it did not dent the enthusiasm for the names. This was to lead to much confusion later, when it was realised in the "age of enlightenment", that many Christian familys carry, and still continue to carry, Hebrew or Jewish names such as Abraham, Isaac, and Joseph, as surnames. With this name the earliest of all recordings are to be found in German charters and registers of the medieval period. These include examples such as Henricus Claus of Eblingen in 1323, Wolframus Klusner of Goddelau in 1398, and Tobias Clausnitzer of Thun, christened there in 1619. The earliest of all recordings is probably that of Uzo Claus of Eblingen, Germany, in the charters of that city for the year 1294.